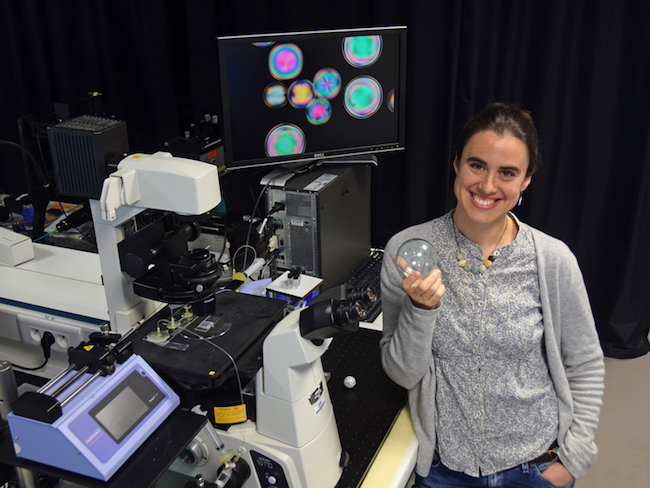 Teresa Lopez-Leon describes how topological defects in liquid crystals could be used to create artificial atoms or to study math problems in the lab. As a child, it wasn’t uncommon for Teresa Lopez-Leon to hear her parents and uncles—chemists, physicists, and mathematicians—discussing the latest discovery in quantum physics over dinner. Back then she had no idea what they were talking about, but the conversations piqued her interest enough to learn. Now a tenured researcher at ESPCI Paris-Tech, Lopez-Leon uses liquid crystals to study fundamental questions in physics and mathematics. Physics caught up with Lopez-Leon to learn more about her fascination with these materials and the kinds of problems she is using them to solve. Liquid crystals are amazing materials that flow like a liquid, but they consist of molecules that align as in a crystal. The liquid crystals that I study are composed of elongated molecules. If you put this liquid crystal on a flat surface, the molecules align parallel to each other. But on a curved surface, the molecules can’t do that. Instead, topological defects—places where the order is not well defined—appear. We study these defects: how they appear, how they interact with each other, and so on. Putting a liquid crystal on a curved surface sounds tricky. How do you do that? I coat a spherical “particle” of water with a liquid-crystal layer, which I call a shell. The result is essentially a drop inside another drop. Why are topological defects interesting to study? They are relevant to many fields of physics like cosmology and quantum physics. For example, cosmic strings—defects in spacetime thought to have formed during the early expansion of the Universe—and vortices in superfluid helium are topological defects. But unlike those systems, the liquid-crystal shells have topological defects that we can see and study using a microscope. The shells offer a playground to study fundamental questions about the structure and dynamics of these defects. Studying the organization of defects on a sphere is also interesting for mathematics: Elucidating the organization of N repulsive particles (or defects) on a sphere is the so-called Thompson problem, one of 18 unsolved math problems proposed by Stephen Smale for the 21st century. This is something we could study with our liquid-crystal shells. Liquid crystals are practically everywhere: in displays for TVs, calculators, and watches. Do you foresee applications for the shells? Displays were the first technological “revolution” for liquid crystals. Researchers anticipate a second revolution where topological defects are exploited to produce structures with amazing optical properties like invisibility cloaks or super-resolution lenses. One possible approach is to use the defects to create directional bonds between multiple shells. If the defects on different shells could be made to interact with each other, then the shells would behave like artificial atoms that could bind together. We still don’t have a protocol to bind defects, but we are working on it. Are there other surfaces you could put the liquid crystals on? I have started to study liquid crystals confined in exotic shapes, like on the surface of doughnut-shaped drops or on drops with multiple holes. These shapes should allow us to produce complex topological defects like knots. These are important in cosmology and other fields of physics but have never been observed experimentally. I am very excited about this project! Your Ph.D. was about colloids and gels. Why did you switch to liquid crystals and defects? I was at a conference and saw a talk about liquid-crystal droplets. I found the system fascinating: It’s simple, but allows us to study complex physics and math. You recently got a permanent position at ESPCI. What advice would you give to someone currently applying for faculty jobs? You have to be patient. Typically you don’t get your position on the first try. It’s very easy to get discouraged, so you need to fill your batteries and keep trying. Know a physicist with a knack for explaining his or her research to others? Write to . All interviews are edited for brevity and clarity. Guillaume Durey, doubly rewarded !